This iHerb code entitles all first-time customers to a $5.00 or $10.00 discount, depending on the size of your purchase, which can be used on any order from thousands of top quality natural and organic products at iHerb.com. 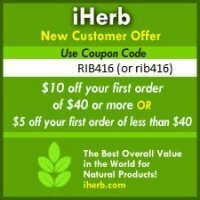 The iHerb referral code to use is RIB416 (do note that it is rib416). iHerb.com's products include natural health supplements; herbs and herbal remedies; eco-friendly household products; bath and beauty products for the body and the skin; groceries; sports and exercise related products; children and baby products; pet products; as well as other natural and organic products. You could click here to access iHerb.com directly and immediately enjoy the $5.00 or $10.00 discount coupon. Their prices are amazingly reasonable and affordable, one of the most competitive you can find online. Many quality natural health supplements from dozens of top brand name companies are available. These include products from Carlson, Doctor's Best, Dr Mercola, Enzymatic Therapy, Life Extension, Natrol, Natural Factors, New Chapter, NOW Foods, Solgar, Source Naturals, Twin Lab, and many more. They also carry items from many top brand names for environmentally friendly products and health foods. These include companies like Dr Bronner's, Ecover, Seventh Generation, Lily of the Desert, Eden Foods, and many more. In fact, there are over 30,000 (and maybe more...) different natural health products, organic items and eco-friendly natural products carried by iHerb.com - there is quite literally something for every health conscious and / or environmentally conscious person. In the ConsumerLab.com 2009 Survey of Vitamin and Supplement Users, iHerb.com was rated the top Online Retailer for Supplement Merchants. They repeated that feat in 2010 and 2011.
iHerb.com is a reliable company which has been around for over a decade. On top of the $5.00 or $10.00 discount provided by the iHerb coupon, you often get to enjoy various other iHerb discounts too, from quantity discounts to percentage reductions when you order above a certain amount. Other iHerb offers are also often available. Shipping is very fast, with your order likely arriving within days. Shipping is also extremely affordable, unlike many other online stores, some of which are obviously overcharging. In fact, shipping is even FREE for US orders over US$20.00. iHerb's customer service is excellent. We had a problem with an item we ordered (the bottle was broken when it arrived), and the company promptly refunded us the amount. If you haven't already done so, make iHerb.com your source of natural health supplements, organic items and eco-friendly natural products. Once again, the iHerb coupon / iHerb referral code to use is RIB416 (again, do note that it is rib416). To receive detailed instructions on how to use this iHerb code, and / or to receive this iHerb coupon code in your email, simply fill in your details here.